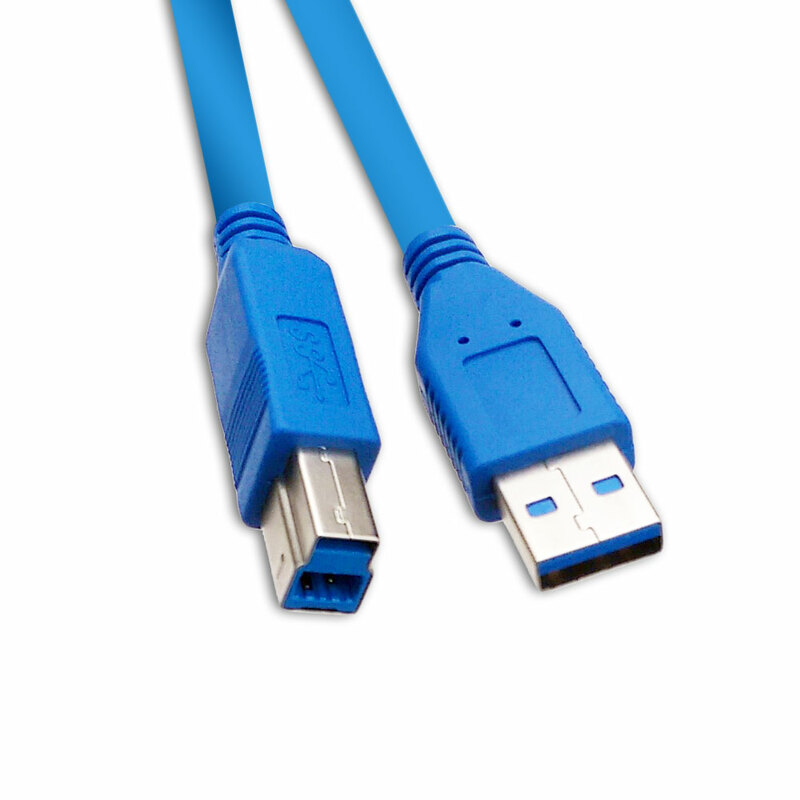 Our blue 10-foot USB 3.0 SuperSpeed printer/device cables offer the next great leap in data transfer speeds for your peripherals. These particular USB 3.0 cables feature a Type A Male (Computer/Tablet/Laptop/Hub side) to Type B Male (device side). This USB SuperSpeed cable enables one to connect a printer, scanner, external hard drive and more to your computer, laptop, netbook or notebook. They work for Windows, Mac, Android, and Linux. The 3.0 specification boasts amazing performance improvements that will allow consumers and businesses to get more done in less time, while still supplying full backward compatibility with previous USB versions. USB 3.0 SuperSpeed features a 10 fold improvement in signaling rate that translates to 5 Gbps versus the older 480 Mbps (USB 2.0). The new Sync-N-Go technology which minimizes user wait time (devices detect and sync faster). USB 3.0 is bi-directional allowing information transfers in both directions at the same time. Add to this the new support for a new interrupt driven protocol, the device can initiate the transfer, vs the old host based device polling. The old way had the USB controller constantly pinging the device, now the device lets the host know when actions start. Lastly USB 3.0 increases power output from 500 mA to 900 mA for faster charging of attached devices and support of more robust peripherals. I made a booboo. I ordered the wrong cable. I'm keeping it because I know I'll be able to use it in the future. Be sure you know about USB 3.0 form factors. The B side is not like USB 2.0 type B and is not backward compatible. Retail stores watch out. Same great product at a better price. Picture of item doe s not show all sidess. USB cable did not fit printer.